A few weeks ago I made a quick trip to the Chicago area, and had just enough time to visit one of the beautiful beaches on the North Shore. Where, I happened across these signs, warning me of the impending doom should I attempt to go swimming. Luckily, I had no intention of swimming (it was freezing! ), but one of the signs caught my full attention. Do you see it? It's the one on the bottom in the middle. The one that forbids dogs and cats on the beach. I can understand why there's a rule about dogs...but cats??? Who brings their cat to the beach? I looked at Mr. W and made a snarky comment about cats and water, and then said something along the lines of, "Does anyone even take their cats on field trips?" Well, fast forward to our ride home from Chicago. We were stuck in traffic on Lakeshore Drive when I glanced at the car to my left. At first look, I thought it as a dog staring back from the passenger's window, but nope. It was a big orange cat. Sitting on an old man's lap, giving me "Help meeeeeeee" eyes. Wow, taking a cat to Nature's Giant Litterbox? No. But every year, we do take our cat to the ranch where my horses are stabled. It's where we take our Christmas picture, so I get the horses (2) ready while my hubby pulls the picnic table into position, then corrals the dog while my son pulls the cat out of her carrier. The horses love Katy the kitty, and run their noses up and down her fur. She hates this, and flattens herself against the table as much as possible. We get the picture taken, eventually, and everybody goes back to their homes/stalls. Katy typically does not speak to us for a week afterward. LOL, Gayle. Love that story--esp how much the horses love your Katy. I keep thinking about that cat I saw--who wasn't in a carrier. It had to have been a very tame kitty! Totally funny sign. I have never in my life seen a cat at a beach and I live in a beach town so I've been to the beach a lot. We have "dog beaches" here, where we take our dog to run free through the surf. 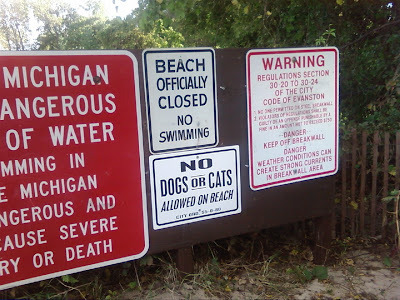 But, as of yet, no "cat beaches." Well, I supposed the signmaking people didn't want to discriminate between cats and dogs. And of course the beach is just one huge litterbox for a cat. 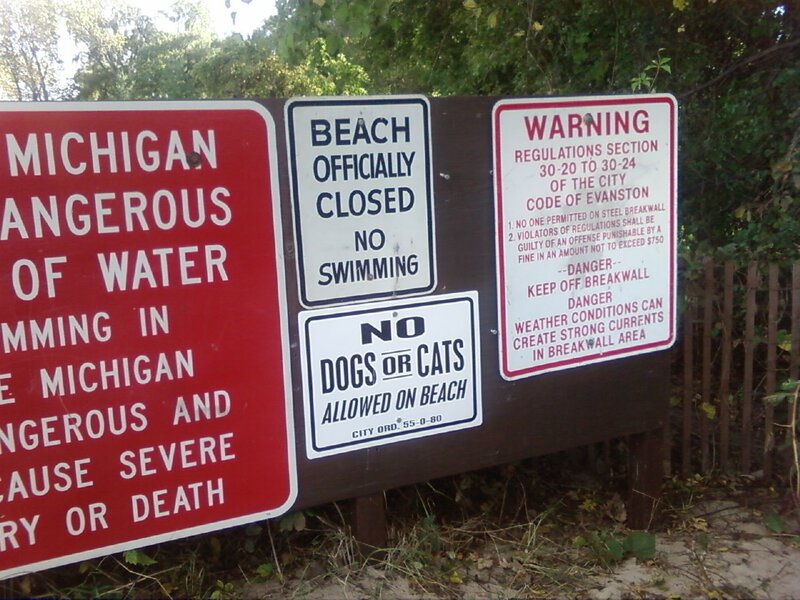 But of course, wild cats can't read signs, so how are they keeping them of the beach? Too funny! Covering all their bases, I guess. I know a few people who travel with their cats, but not to the "great outdoors". I would never recommend traveling with a cat that is not in a carrier or on a leash - too risky, even if your cat is well trained. My dad did that once and his cat slipped out when he stopped for gas and he never found him again. Cats are not very good at coming when called - especially when scared. I can just picture my cats seeing a beach though - their little hearts might stop at the excitement of that big a litter box! My husband once thought he'd be doing our cat a big favor by taking Squeek to the aforementioned world's biggest sandbox. A nanosecond after setting him down he was racing back through the dunes with my none-too-athletic engineer husband in pursuit. But on a recent trip to the Oregon coast we saw an older couple with their cat in a harness and it was calmly meandering through the driftwood and along the sand. So apparently some kitties do enjoy a walk on the beach.